FREE PERFORMANCE. Join us on January 26, 2019, for THRIVERS. THRIVERS is a modern opera written and composed by Michael Ching. 18 Young Adults will perform in the opera that tells the story about depression and bullying. THRIVERS will be performed January 26, 2019, at Rancho Mirage Library with two showings – 11 am and 1 pm. OPERAtunity is a program for high school classical vocal training. Two composers, three singers, a librettist, a coordinator, plus an accompanist, came together for OPERAtunity – a ten-day vocal workshop intensive for 15 qualified high school singers from the Palm Springs Unified School District. This intensive program, OPERAtunity, took place January 10 – 21, 2018 and began with a placement audition at each school the week before the workshops. The workshops were college level and aimed at career preparation for students interested in exploring a career either as singers or in the administrative world of classical music. During the intensive, students were assigned at least one solo piece and one ensemble repertoire that introduced them to the concepts and techniques inherent to classical vocal performance (breath support, diction, practice/time-management, stage presence, historical context, and modern developments.) This past January students performed SPEED DATING TONIGHT. 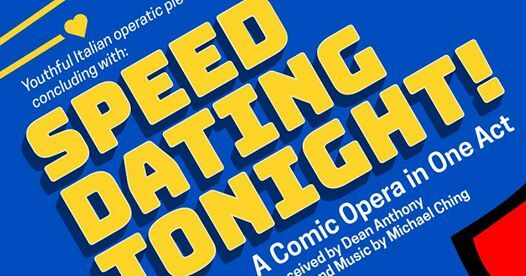 Throughout the workshop, students worked one-on-one with the professional staff preparing for a showcase at the end of the program which included scenes from Speed Dating Tonight – Michael Ching’s comic opera Speed Dating Tonight! which tells the story of a single hour in the lives of a group of people experiencing speed dating for the first time. It takes place in a local restaurant and includes colorful characters like a car salesman, origami designer, realtor, Tech addicts, and an over-the-top cat lover. Love at first sight, as well as two exes running into each other, are just two of the comical and romantic moments. The students learned this modern-day opera over the course of just 11 days. The show, at the Helene Galen Performing Arts Center on Sunday, January 21, featured the high-school singers. It was made possible by generous grants from Jay Bartush & the Bartush Family Foundation, Rosie Vacano and Audrey & Courtney Moe. Watch this site for information about next year’s OPERAtunity and how you can help support this important initiative.